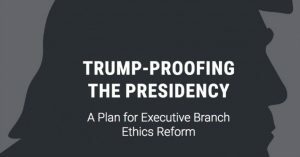 “The election of Donald Trump as president exposed numerous shortcomings and outright chasms in the ethics laws that govern the executive branch of the U.S. government,” declares a new report from a pair of watchdog groups that argue much can be done to close loopholes the president has exploited since taking office. The report also recommends revisions to policies that apply to special government employees such as billionaire Carl Icahn—who served as a “special adviser to the president on overhauling federal regulations”—and those governing White House contact with the Justice Department, which Trump has repeatedly sought to stymie and strongarm to suit his needs. Previous analyses published by Public Citizen this year have outlined how Trump’s campaign has spent millions enriching the president’s business empire—from which he’s refused to divest, despite public outcry—and how dozens of political candidates, foreign governments, and interest groups have frequented Trump properties since his inauguration in hopes of influencing the president.